I hope you are all having a wonderful week. Mine went very fast since I worked only for two days in the office and drove to a near by city to have a three-day-training after that. The second day is over today. Although I like leaning new things and connecting with new people, a training requires a constant attention so I feel a little drained. It was also a mistake on my side that I booked the training right on time for our wedding anniversary, which was yesterday *cough cough*. I made it somehow up to hubby by booking a hard-to-reserve restaurant (because of its Michelin Guide Star) three week ahead for last weekend. I can't wait for the weekend to take some rest but it won't be easy since I will be traveling to Frankfurt on Saturday for a beauty fair. Hourglass Ambient Lighting Bronzers come in larger pans than their blushes and have 11 g of product. You can see the size difference in this photo. I believe it might be close to their Ambient Lighting Powders. I only own those in a palette so couldn't check it out for you. I really like the modern and chic looking packaging of Hourglass products although it collects a bit of finger prints but I don't care about those sort of things (do you?). The closure is not magnetic but it is one of the easiest to open and closes very safely. Now not that I can't wear warm blushes but I see this one turning orange if you have very fair skin, although it is more golden than orange so maybe fair to medium skins (like myself) can get along with it. 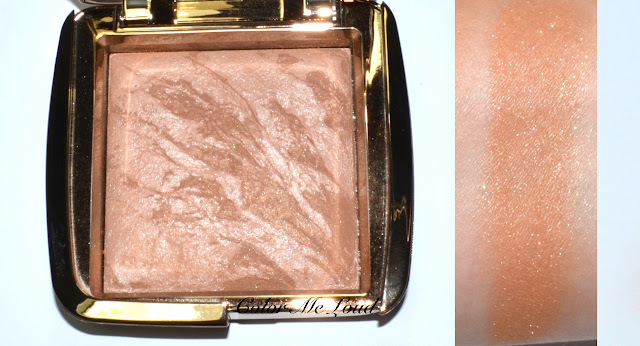 It also has the most glow finish of all the bronzers I have on rotation at the moment. My absolute love MAC Studio Sculpt Delicates (reviewed here) is one of the warmest shades I am loving at the moment, together with Smashbox Bronze Lights Deep Matte (reviewed here). 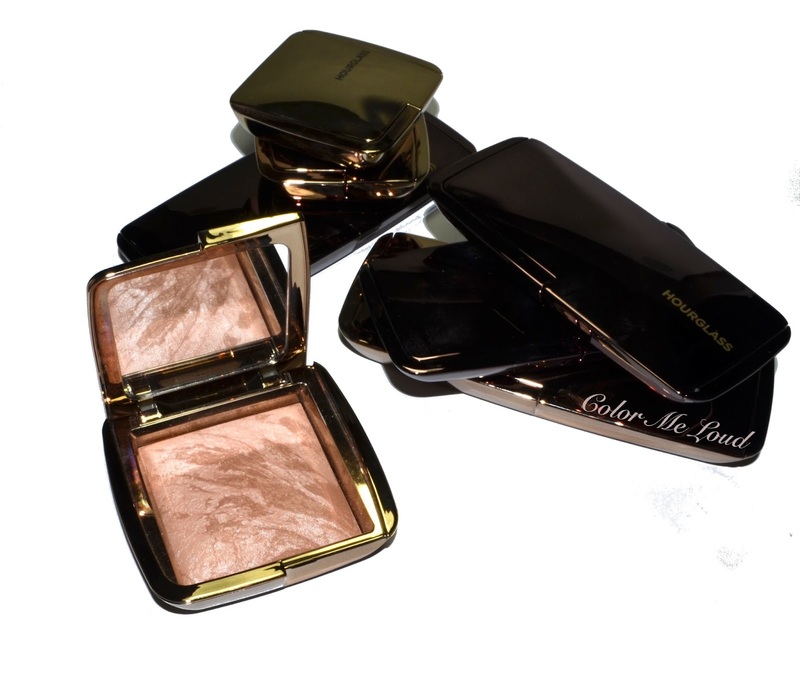 Hourglass Ambient Light is deeper and more shimmery than both. You can see that MAC Studio Finish offers something ike a satin finish whereas Hourglass Ambient Light is really shimmery. It is also light, which makes it a great product for an overall bronze & glow if you have deeper skin than mine. On me it would be too dark to use it that way. Other comparison swatches below show that Tom Ford Gold Dust (review coming up soon) and Guerlain Terracotta 02 (reviewed here) are both deeper and less shimmery. 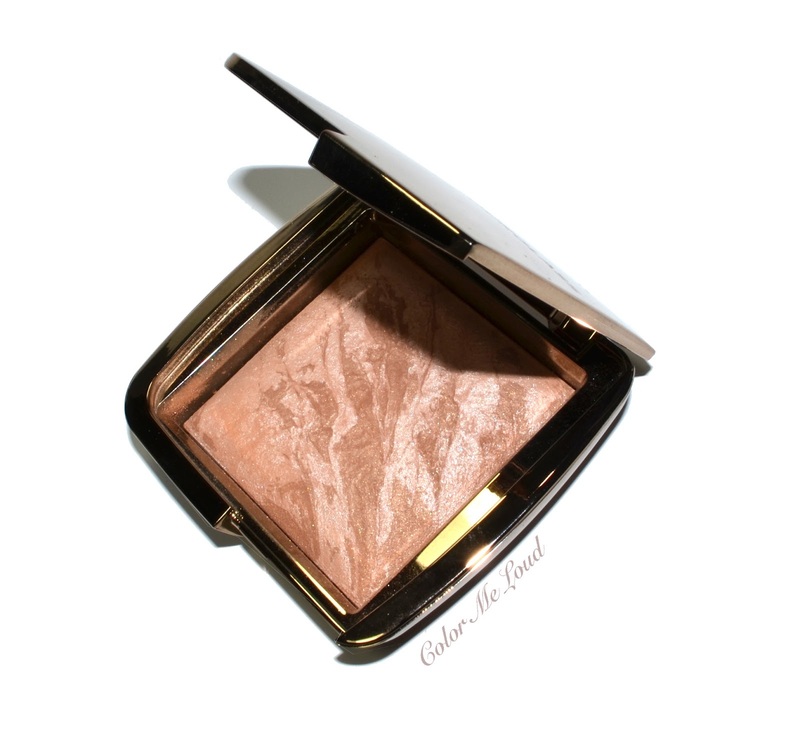 I have already mentioned about the dupe alert between Chanel Lumber D'Ete and Hourglass Ambient Light Bronzer. They are very close but Hourglass is a little more shimmery. Guerlain Joli Teint 03 Natural Brunettes (reviewed here) is lighter, Guerlain 4 Seasons 03 Natural Brunettes (reviewed here) is deeper. Now I mentioned about eating at a starred restaurant last weekend. Here is the look I wore. You can see all the products here at Instagram. On the eyes I am wearing Tom Ford Crushed Indigo (reviewed here). On the lips I have one of RMK Glow Lipsticks, review is coming up soon. I was rushing to the restaurant and you can see that the bronzer is not properly blended (sorry for that) so it looks a bit too warm for my liking. 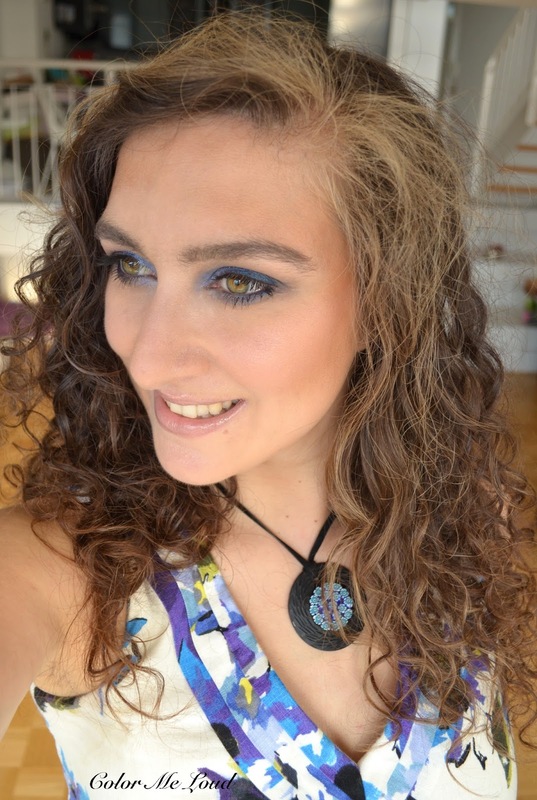 I like wearing a good amount of bronzer with blue eye shadows, think it makes them work better on my skin tone but this one was a bit too much somehow. Nevertheless it gives a nice glow without using highlighter. Still I prefer matte to satin bronzers and applying highlighter wherever I wish afterwards. That way I have more control where I apply it. Also since I place bronzers more like a contouring product, sheen glow doesn't always look all that natural. Final thoughts: Hourglass Ambient Lighting Bronzer Luminous Bronze Light is one of the lightest, warmest and most shimmery bronzers in my collection. If you are warm and fair and like a healthy glow on your cheeks, you might want to check it out. If you are deeper and you are in the market for an overall powder, you might like it too. I prefer matte bronzers because of the way I apply bronzers but remember I said I don't like them and ended up loving the Hourglass blushes too? So maybe bronzer will also grow up on me, who knows. Do you like your bronzers matte or glowy? Why? Disclaimer: The product in this post was purchased by me. I usually like them matte but I'm definitely going to pick this one up soon! I am not entirely sold on the Hourglass products, to me glowing everything can translate to an odd application since I too like to apply bronzer in a 3 on my face where one usually uses contour. BTW, errata spotted: Delicates is a Studio Sculpt Bronzing Powder. A mouthful I know! thanks so much for pointing out. I am at a training at the moment and rushing a little through the reviews, therefore I appreciate the feedback and typos f they are pointed out very much. Exactly because of that reason I am not totally sold either. I use it partly like a contour and a shining contour doesn't work all that well. Let us know how you like it, leave the link to your blog post here if you happen to review it. Hey Sara, hmm hmmm hmm. It really is quite warm! I think I can pull it off since it's similar to the Chanel bronzer (which I adore), but at the same time it seems rather sparkling! I do fine with a bit of a sheen, but anything more is tricky because I also do the 3 thing and I don't want my whole face to shine! WOW it is the most shimmery out of the lot. I guess it's OK for bronzers to look glowy and a bit warm - contour is completely different. I really like the looks of the Chanel Les Beiges and Lumiere D'ete though. Too bad there isn't a Chanel counter near where I live. Guess my wallet's safe. LOL! The Hourglass product name is hilarious, so impossible to remember or write correctly (that's a bad thing for social media, how don't they realize that). You look gorgeous in this dress, Sara! Following your advice, I think I will try to re-create a similar eyelook with Dior Cabine, Chanel Marine and a L'Oreal white-blue duochrome shadow in Cameleon 601. Sometimes pictures just accentuate makeup, perhaps your bronzer did not look unblended. I prefer when bronzer is applied lightly and sheer, if at all, but I am not an expert in face makeup. I got bareminerals the wave palette and the skinny dip bronzer (the lightest shade which is still too dark for me), so I am still trying to find a way how to make bronzer look on my face more natural and less dramatic. Luxe bronzers have plenty of shades, but they have silicons, silica, oils, so I can not jump on this is bandwagon. 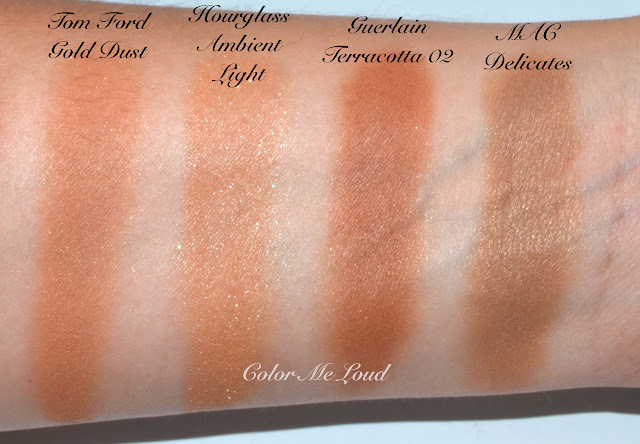 I was very excited when Hourglass announced they were adding Ambient Bronzers to the range. But I can't help being very dissapointed with the shades. I don't see these to work for me at all. Too bad really. I don't mind glowy bronzers, Charlotte Tilbury Bronze&Glow is my current most used one and I love it! My first thought was that I'd be all for a glowy bronzer, because I like glowy face products. However, after reading your review and some of the comments, I'm not so sure. I use my bronzer mostly to contour and the point of contour is to fade into the background, not grab attention! You are so beautiful Sara! The dress, the necklace the make up! So summery and energised! Thank u so much for your review.i had this piece in my cart but i removed it after i saw the swatch! It seems so orange to me.ii reminds me laura mercier's baked blush bronzer in the shiny effect at least on swatch.i'm gonna skip and go to try the blushes instead.thank you again for your to the point review!! I am glad I saved you some $$$ which you can invest to other pretties :-) There are enough of those. I think you will love Hourglass blushes, they are really pretty. They don't last on me so long but they give the most beautiful glow on the cheeks. Let me know how you like the one you ordered. Thanks Jenni. This one is not a product I would reach for when I am rushing, not again lol. Hi Stacey, I think this one is really very warm, can pull orange on you. I would say try before buy. Oh LA, take me with you! I know what you mean. That "Bronze" shade they mixed with their highlighters/face powders is very warm. I hope they extend the range with a cooler shade next year. 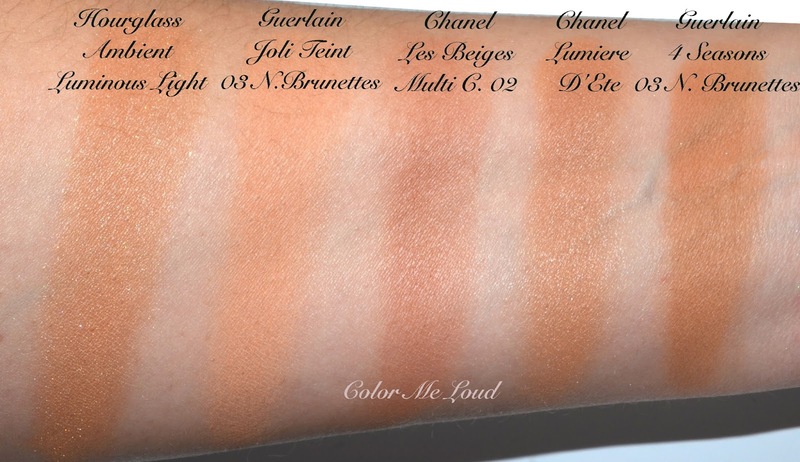 Chanel Lumiere has exactly the same problem, it is warm and rather glowy so on me it doesn't work as contour either. I love contouring with Tom Ford Terra at the moment. Yes, blushes are really very pretty. It is not bad, you must be happy that there is no Chanel close by. I sometimes manage to ignore the launches, then they call me and invite to the counter, *sigh* I can't resist when I see the pretties! do you use the Chanel bronzer as contour? Because that one is also rather glowy. Not as much as Hourglass one but still a little outside my comfort zone of contouring products. Hmm well I wouldn't say I contour with anything. I do the "3" motion on the sides of my face, my forehead, bridge of the nose, and a bit on my chin. I never really do a line or whatever and the Chanel one works well for me this way. Beauty fair was nice and was a doping when I was there but at home I ended up being even more tired haha. Yes the names of the products are really hard to remember. I say this one is the "light" one and other one is deeper. Thanks so much for your compliment. Yes photos show things you never know existed. I blend take a photo and see it was not properly blended, blend a little more and see that it looks better. This time I didn't have time to go back and forth though. I have to yet try Bare Minerals bronzer. I will check it out. I think the best tip is to get the most of the access on the back of your hand and build slowly and gradually. That way they look more natural. I actually find Chanel and Hourglass quite close in my plethora of bronzers. Do you have warm undertones? If it turns orangy, you may want to check cooler toned ones such as Tom Ford Terra or Smashbox Deep Matte. Thanks for the suggestions! I will definitely check both out, which do you find is lighter?